Quiddler®, the award-winning card game, is now available in a Deluxe version exclusively at Barnes & Noble in 2010! 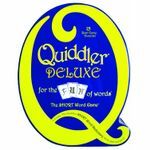 Quiddler Deluxe includes the Quiddler card game, The Quiddler® SHORT Word Dictionary, a score pad and pencil in a unique collectable tin. Quiddler is a delightful challenge for rookies and wordsmiths alike. It is the perfect family game and great for parties, too! The challenge is to arrange your entire hand into words. Draw and discard each turn. Try to use your high point letters, but don’t get caught with them in your hand. The game has 8 rounds. Each player has 3 cards in the first round, 4 in the second, and so on, up to 10. When a player goes out, everyone else has one last chance to draw and put down the words they can make. The Quiddler SHORT Word Dictionary is an extensive collection of only short words. It was created to increase your competitive edge while playing Quiddler, The SHORT Word Game. With over 10,000 short words, the dictionary is organized both alphabetically and by the number of letters per word to help you easily find the best two, three, four and five letter words. With the cards you are dealt and The Quiddler SHORT Word Dictionary as your companion, you'll be sure to dominate the short word bonus!